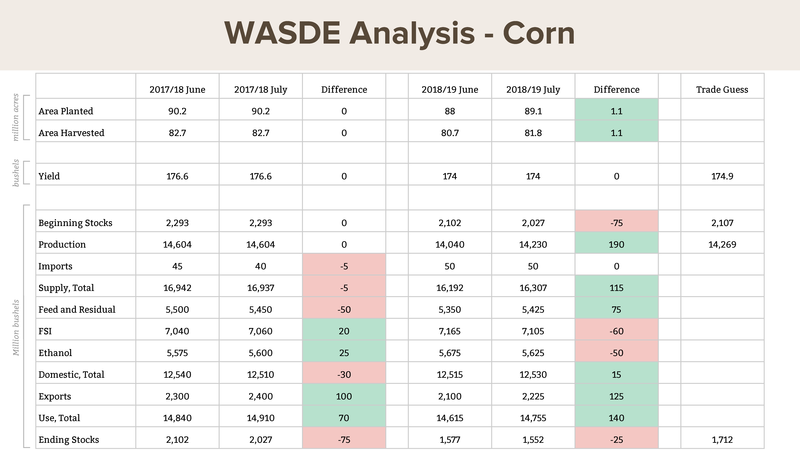 Corn production is greater than anticipated, the bean market looks bleak, and wheat has remained fairly consistent. 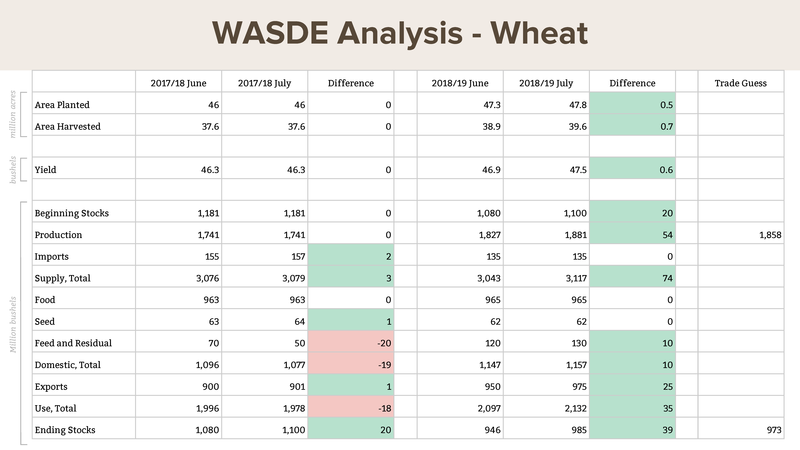 In our recent webinar with The Hueber Report, Dan Hueber provided some key insights into the July WASDE Report. Planted acres increased by 1 million from last month's report to 89.1 million acres planted. This is about 1 million less than planted corn acres in 2017. Harvested acres are at 92% of planted. Due to the weather and drown out that’s happened this season in Illinois, it’s something to keep an eye on as we approach harvest. Yield estimates are at 174 bushels, unchanged from last month despite the trade expecting to see at least a ~1 bushel increase. USDA showed an increase in usage of 140 million bushels from the previous month, currently at 14.7 billion bushels. Production is at 14.2 billion bushels, nearly 200 million higher than the previous estimate (due to the acreage shift). This is ~39 million less than what the trade was anticipating. Stocks-to-use ratio is down to 13.89%. The years of 1995–1996 were the last time we saw a stocks-to-use ratio like this. Planted acres increased, leaving us at 89.6 million planted acres. This is the second time in history that bean acreage is higher than corn. Harvested acres are at 99% of planted acres. Yield estimates are unchanged from last month, at 48.5 bushels. USDA showed a slight increase in usage from last month, currently at 4.2 billion bushels. Production has slightly increased, currently at 4.3 billion bushels. Stocks-to-use ratio is at 27.74%, down just slightly from last year. 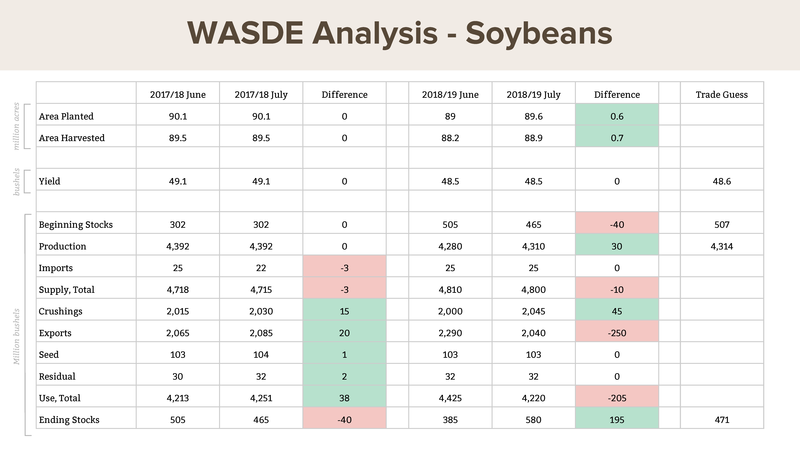 The raw numbers indicate that it’s tough to build a bullish case for beans. We’ve been on the bottom of the bean market for the last 4-5 years. However, with 3-4% more cattle & hogs, meal is the market to watch that might bring beans back up. Planted acres increased, leaving us at 47.8 million acres. This is most likely due to north spring wheat. Harvested acres are around 83% of planted acres. Yield estimates have increased from last month, now at 47.5 bushels. This is likely due to soft winter wheat not being hit as hard as anticipated. 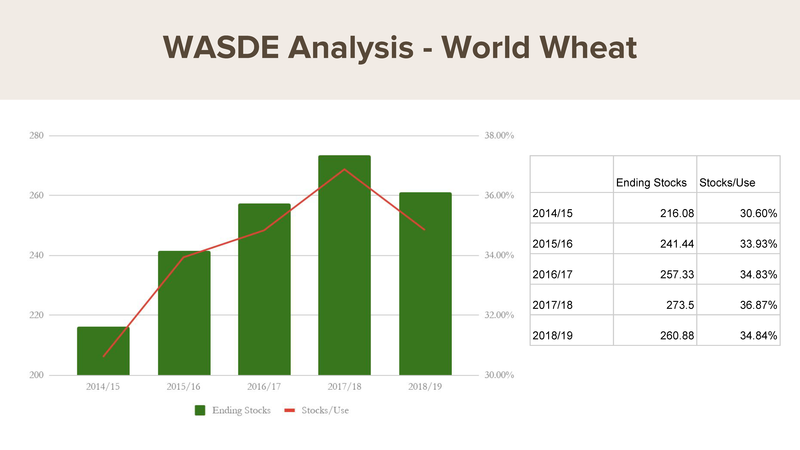 All in all, wheat is on track with what was expected. 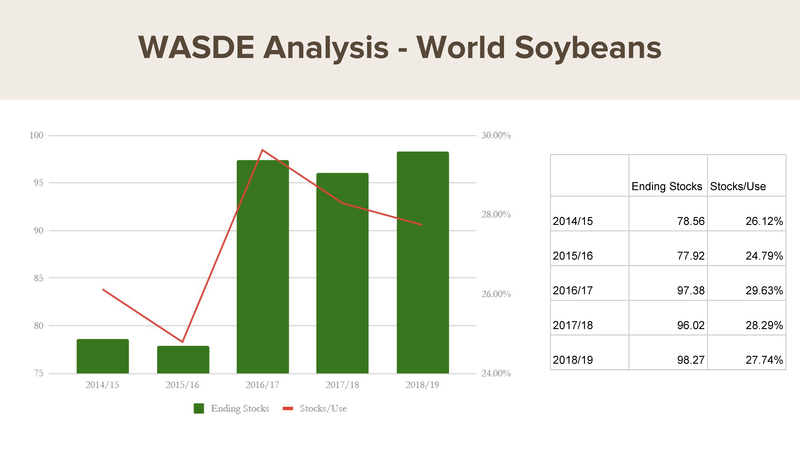 USDA showed a slight increase in usage from last month, currently at 2.1 billion bushels. Production has increased, currently at 1.88 billion. Exports have also increased to 975 million (up from 900 million last year). France, Germany (Europe’s top wheat producers), Russia, and Ukraine have ongoing problems with production. The stocks-to-use ratio has decreased by about 2% from last year, and ending stocks are slightly above the trade had estimated. What is the stocks-to-use ratio? The stocks-to-use ratio looks at total global usage as compared to the estimated ending stocks. Simply put, it’s the entire supply and demand equilibrium boiled down to one number. If the stocks-to-use ratio is declining, that means the usage is growing faster than we can produce it. A higher stocks-to-use ratio is generally considered to be bearish. 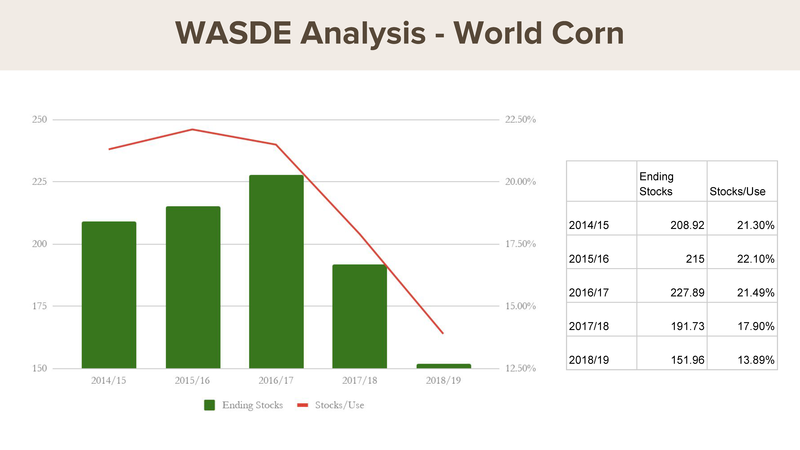 Share: "July WASDE: What it means for corn, beans, and wheat »"